India is a nation with a multi-faceted culture, being rich in the arts and on a path to make an impact on the globe as we emerge to be an economic global leader. It is important for us to train our next generation of global citizens to make effort to understand and appreciate the various global cultures around us while also strengthening and spreading our Indian art and culture. On the eve of our nation’s Independence Day and on the occasion of his 150th Birth Anniversary, it is appropriate to recall the contributions made by our great Rabindranath Tagore. He lived more than a hundred years ago, yet is representative of today’s generation of global thinkers – a man who was influenced by the world, and also made a huge impact on the world. Tagore visited more than 30 countries on five continents, many of these trips being crucial in familiarising non-Indian audiences with his works and spreading his ideas. He allowed himself to be influenced by the world cultures of his time. His songs and compositions clearly indicate this. The songs “Phule Phule Dhole Dhole” and “Purano Shei Diner Kotha” are both examples of Tagore’s songs influenced by western music. The latter song has the Scottish highland influence. The original song from which this tune has been derived is the well known Scottish song “Auld Lang Syne”. While on the one hand the world had an impact on him, Tagore continues to impact the world in turn with his writing and poems. This can be gauged by the numerous festivals honouring him across the globe. A friend recently gave me the English translation of a children’s poetry written by Tagore called “Birpurush” (“brave boy”). I was struck by the simplicity with which Tagore has portrayed a little boy’s dreams of courage and bravery. Reading this poem has caused in me a deep desire to read all of his works. How I wish I could read Bengali. Rabindranath Tagore was a musician, composer, poet, novelist, painter, playwright, actor, educationist and the first Indian to be awarded the Nobel Prize for Literature. 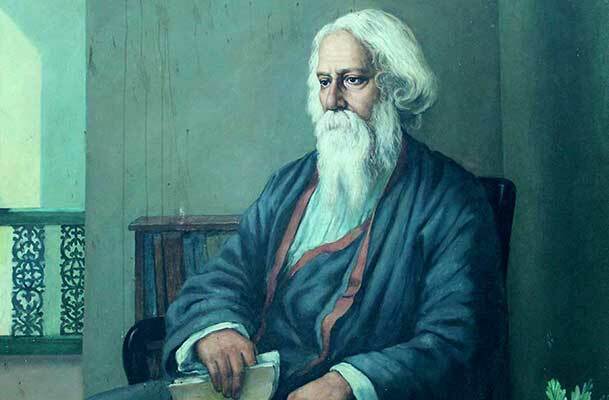 While he was a prolific painter and was known mostly for his poetry, Tagore also wrote novels, essays, short stories, travelogues, dramas and composed roughly 2,230 songs. His immensely popular songs form a foundation of Bengali ethos that is comparable to that which Shakespeare has on the English-speaking world. Music was an integral part of his life. Tagore has been writing poetry since he was 8 years old. At age 16, he published his first substantial poetry and wrote his first short stories and dramas. My wish is that our children learn world music, theatre, poetry, dance and continue to be inspired by the dynamic contribution of this great son of the soil who has given us our National Anthem. Reading the English translation of “Jana Gana Mana” fills me with awe and a desire to worship our Creator God, the dispenser of India’s destiny. My heart fills with pride and gratitude to be born in this great land.